In our lab we have the need to have one environment which is running OpenStack Essex and another which is running OpenStack Folsom. Here’s a guide on how we setup our infrastructure so we can support the two environments in parallel. 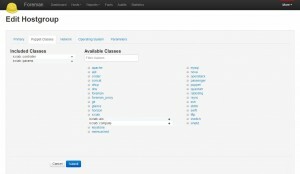 Here it is only described how to integrate OpenStack Foslom with Puppet/Foreman. It is assumed that Puppet and Foreman are already set up according to the articles mentioned above. 2 environments will be created: `stable` and `research`. In the stable environment are the puppet classes for Essex and in the research environment the Folsom classes. This issue is desribed [here](https://github.com/puppetlabs/puppetlabs-horizon/pull/26). After that in Foreman you can create new hostgroups and import the newly added classes (More – Puppet Classes – Import form local smart proxy). Define stable and research environment and 3 hostgroups in the research environment: os-worker, os-controller, ow-aio. Next assign the icclab::compute and icclab::params class to the worker hostgroup, icclab::controller and icclab::params class to the controller hostgroup and icclab::aio and icclab::params to the aio hostgroup. Since we are using Ubuntu 12.04 it is required to add the Folsom repository to your installation. In order to do that create a new provisioning template. Copy the existing one and add line 14-18. 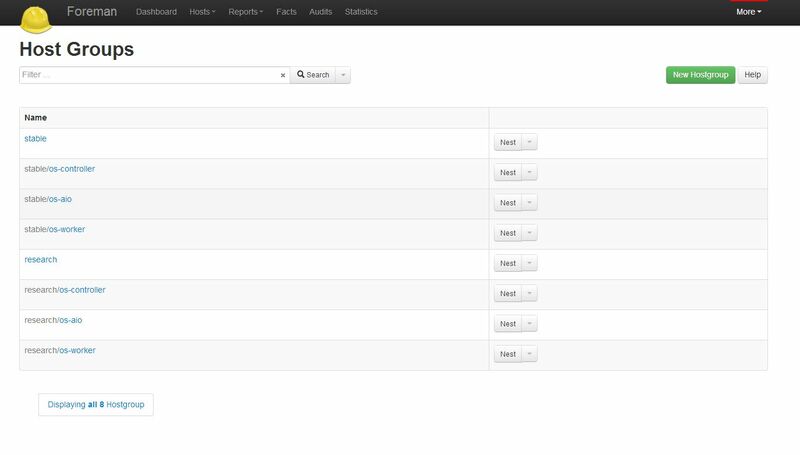 After that click on Association, select Ubuntu 12.04 and assign the research hostgroup and environment. In our case it was due to wrongly configured iptables by open stack. With these steps followed you should then be able to go about provisioning your physical hosts across both puppet environments. In the next article we’ll show how we’ve segmented our network and what will be the next steps in progressing our network architecture. 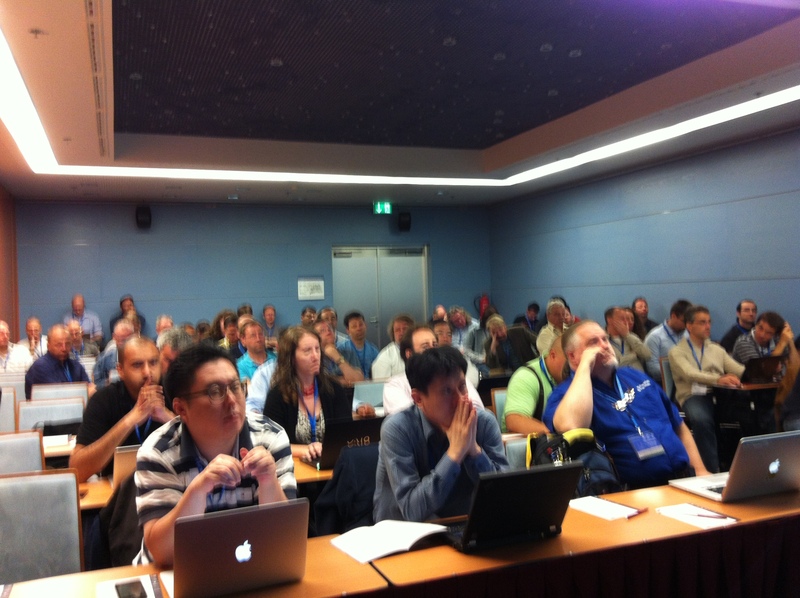 The ICCLab presented at SwiNG SDCD 2012 on how you can easily provision bare-metal physical servers. This presentation, “From Bare-Metal to Cloud” was an updated version of the presentation that was made at the EGI Technical Forum in Prague. The slides can be viewed below or downloaded from here. As well as presenting the ICCLab was part of a discussion panel on the role of Cloud Computing and academic research. On the whole, it was a very interesting and rewarding event. It doesn’t make sense to continually download the same operating system packages when you can cache them along side your Foreman installation. Assuming you use a debian based OS, in order to do this and have a cached copy of all packages you use within your infrastructure simply install apt-cacher or apt-cacher-ng. Our preference is for apt-cacher-ng but we’ll show you how to install both. You shouldn’t have to adjust the configuration of apt-cacher-ng for the basic functionality it offers, however if you need to adjust settings in `/etc/apt-cacher-ng/acng.conf`. Once you have setup apt-cacher you can then create a new Foreman “Installation Media Source”. Simply supply a sensible name and importantly set the URL of that installation media source to `http://$FOREMAN:3241/ubuntu`, where $FOREMAN is either the IP or FQDN of your Foreman host. So all our work in the previous articles has been leading up to this one. In this article we’ll describe how you can deploy a full multi-node [OpenStack](http://www.openstack.org) cluster beginning from bare metal using [Foreman](http://www.theforeman.org) and [puppet](http://www.puppetlabs.com). Before continuing we should note what exactly ‘bare metal’ is in this context. Bare metal refers to physical server hardware that has not yet been provisioned with an operating system. When provisioning this bare metal, it is assumed that the underlying network has been setup (e.g. L2 configurations). For the purposes of this article all setup will happen in a virtualised environment just as in the previous articles. It will also draw upon those previous articles. The first requirement is to have a successfully running installation of Foreman. You should find all the information on how to do this in [the articles](http://www.cloudcomp.ch/2012/06/automating-the-icclab-part-one/) on [setting up Foreman](http://www.cloudcomp.ch/2012/06/automating-the-icclab-part-two/). Once Foreman has been setup the next thing that you will need to do is to deploy the OpenStack puppet modules as described in [the article on puppet and OpenStack](http://www.cloudcomp.ch/2012/07/puppet-and-openstack-part-one/). Note, that you must only execute up to and including `git clone https://github.com/puppetlabs/puppetlabs-openstack` in the “Select Puppet Modules” section. Once you have completed this then follow this procedure. The OpenStack modules require that `storeconfigs` is enabled. To do this you need to edit the foreman configuration file, in our case the foreman-installer manifest located at `/etc/puppet/modules/common/foreman/params.pp`. In there you will need to set `storeconfigs => true`. Once this is done you will need to run the foreman-installer again. 1. Install all the necessary OpenStack puppet modules. Now execute the rake command `rake modules:clone` as in the [puppet OpenStack article](http://www.cloudcomp.ch/2012/07/puppet-and-openstack-part-one/). 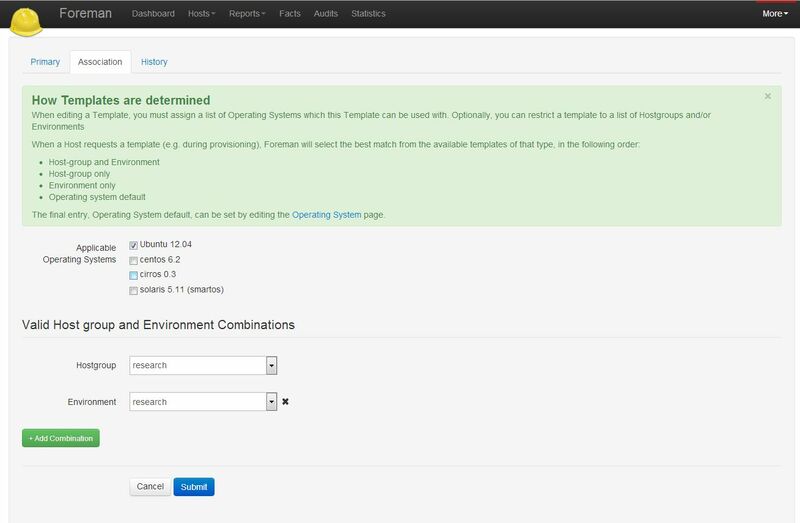 All other modules that the OpenStack requires will now be placed in the `iaas` environment. 2. Import the new environment and all associated puppet classes into Foreman. 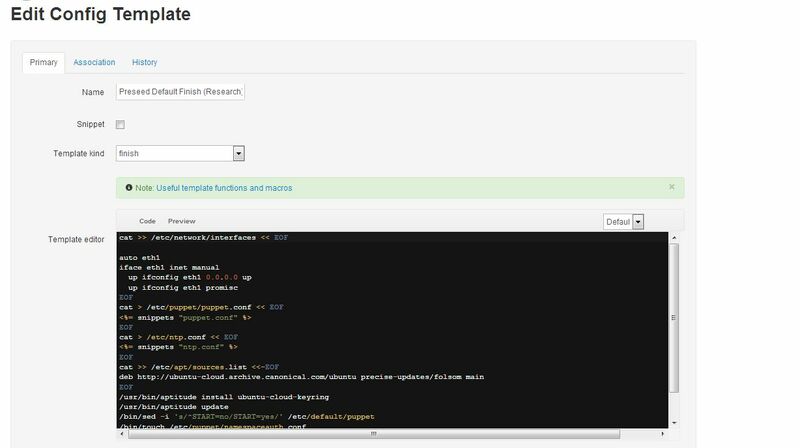 In the Foreman web interface import the new `iaas` environment and all its associated modules. Do this by navigating in the web interface “Other->Puppet Classes” and clicking on “Import new puppet classes and environments”. A screen will then show the new environment to be imported, along with its modules and await your confirmation. Now that these steps are complete, you will want to create some class definitions in a module with which you can apply against new Foreman managed hosts. Below is an example structure of module followed by the contents that defines both the OpenStack all-in-one, controller and compute node roles. * [`all_in_one.pp`](https://gist.github.com/3118975): This will setup an all in one installation of openstack. Note that as we’re setting this up in a virtualised environment, `libvirt_type` is set to `qemu`. If you were deploying to bare metal, this value would be `kvm` or another suitable hypervisor. Also to note, this file looks almost identical to the `site.pp` file we previous used. With this module created, you will need to import it just as you did when importing the `iaas` environment. Doing this will simply update the current environment. 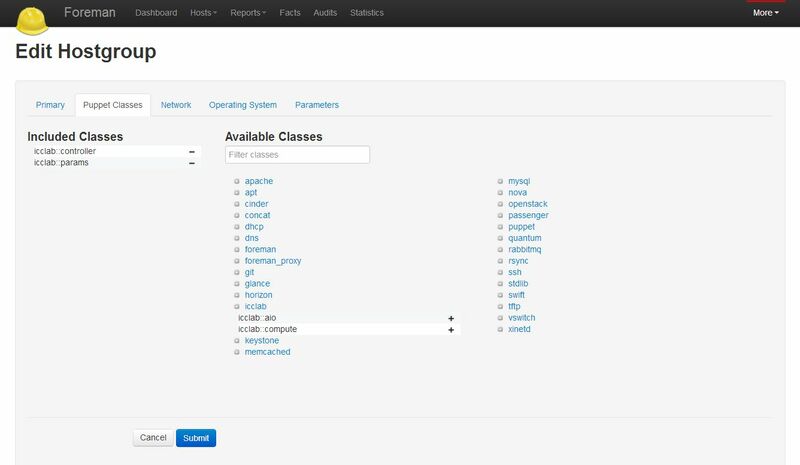 Now that you have imported everything, you can now provision a host with Foreman and when doing so select the `icclab::controller` resource class for the new host after ensuring the field ‘Environment’ is ‘iaas’. Once the new host boots over PXE, installs the selected OS (Ubuntu 12.04 in this case) and the post-install script executes, the OpenStack resource class will be applied to the host and you will now have a brand new and shiny OpenStack controller node. 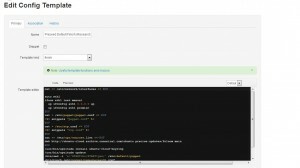 To add compute nodes is almost the exact same process except rather than selecting `icclab::os_controller`, you will select `icclab::compute`. Simple, eh?! You can add as many compute nodes as you have hardware to this arrangement. Ok, so not everything is as simple. There was one major issue encountered while doing this work. Here we manually place the types and providers in a place where puppet will find them. Naturally this solution is not perfect however can be further automated by a `cron` job or executed when there are updates to the effected modules.